What do holiday parties, the King of Siam, and Eisen Alliance have in common? How many times have you realized that no one is talking about the one thing which needs to be discussed? 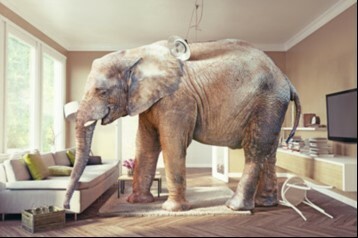 "Elephants in the room" inhibit spontaneity and intimacy. In the workplace, they impede creativity, collaboration, and productivity. A “white elephant” can have similarly damaging effects.The term “white elephant” comes from the tale of how the King of Siam would give a white elephant to a disfavored person because the cost of sustaining the elephant (which was considered holy and could not be used for labor) would bankrupt the recipient. Fortunately, elephants also symbolize strength, wisdom, collaboration, and patience – qualities which provide a strong foundation for all relationships. At Eisen Alliance, we use our wisdom and experience to constructively address the elephants which drain energy and creativity from the workplace. Wishing you light, warmth, and joy during the holidays.